From Anthony William's "C++ concurrency in action - practical multithreading", section 1.4.1 gives a simple "Hello world" program using C++11's thread. After Matthew Wilson re-starting his series in Overload, "Quality Matters #7 Exceptions: the story so far" http://accu.org/var/uploads/journals/Overload114.pdf page 10ff, I had a nagging feeling I should put some exception handling round this. First question, what happens if we make the hello throw an exception? For example, what would this do? It calls abort. The thread function mustn't let exceptions escape. Also, main should probably catch some exceptions; for example, maybe there aren't enough resources to start the thread yet. //erm... what to do with it? Right, so now we are ignoring any exceptions that get thrown. What should I do with any exceptions I get in a function that's sent to a thread? I could use std::exception_ptr, and std::rethrow_exception when a client tries to get the result. It might be better if I read all of Anthony's book (esp Chapter 8) and use std::packaged_task instead. accu-general (http://accu.org/index.php/mailinglists) helpfully told me to read all the chapters in the book concurrently. 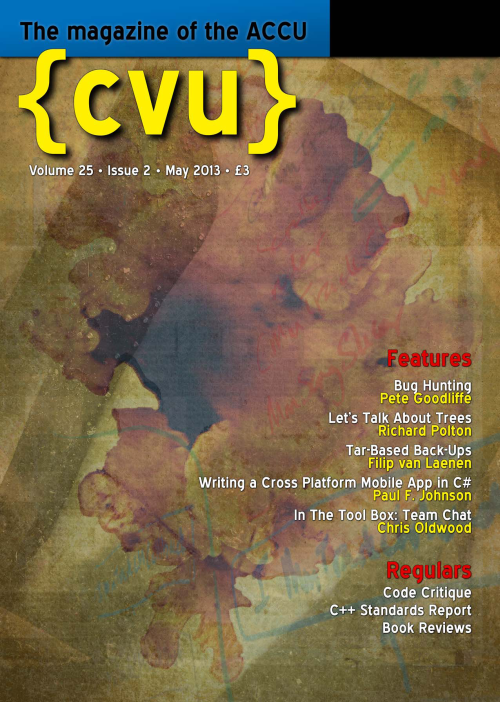 The latest C Vu magazine from ACCU is out now. It contains my latest Becoming a Better Programer column. This month it's called Bug Hunting and, as you might guess, is about the art of debugging code. This was inspired by conversations with Greg Law in the lead up to the 2013 ACCU conference.